Cozy is the name of the game these days! 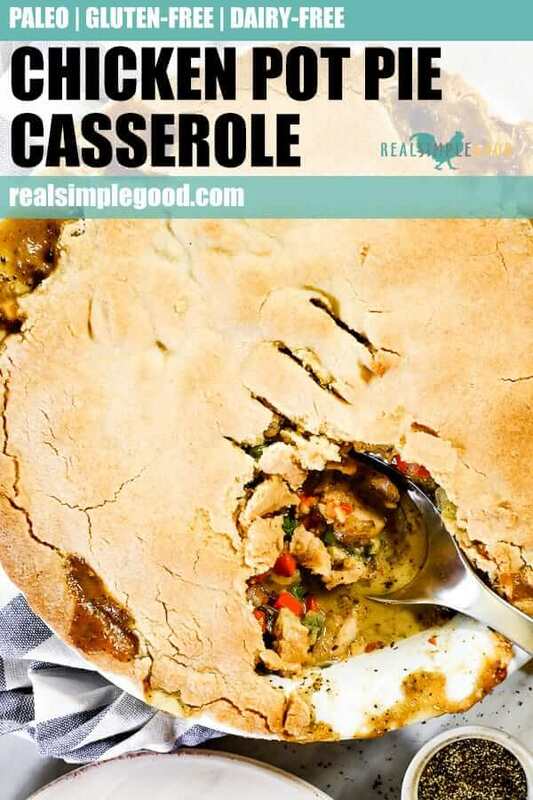 This Paleo chicken pot pie casserole is maybe one of our coziest recipes to date! 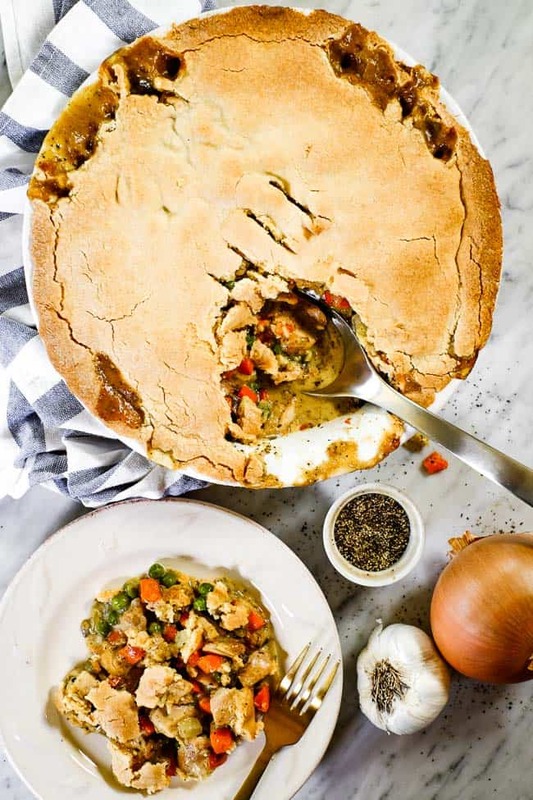 It’s got a creamy, dairy-free filling with all the goodies you’d expect in a chicken pot pie, and then a crust on top that will have you swooning. Like for reals, I can eat this all day long and we keep making it again and again. 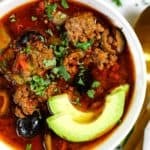 It’s filling and satisfying without being too much, and I can’t get enough! Disclaimer: We partnered with Bob’s Red Mill to bring you this post. We only work with companies and brands we truly believe in and use ourselves. Therefore, all opinions and recipes are entirely our own. Thank you for supporting Real Simple Good and our partners. The filling is what makes this dish feel indulgent! 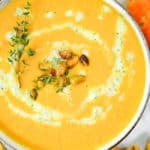 We used full fat coconut milk for the dairy-free, creamy goodness and thickened it up with Bob’s Red Mill Tapioca Flour. 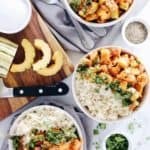 Make sure you get the Tapioca Flour really worked into the vegetables before adding the chicken broth and coconut milk, and then whisk any clumps out. It works like a charm and turns out really fantastic! 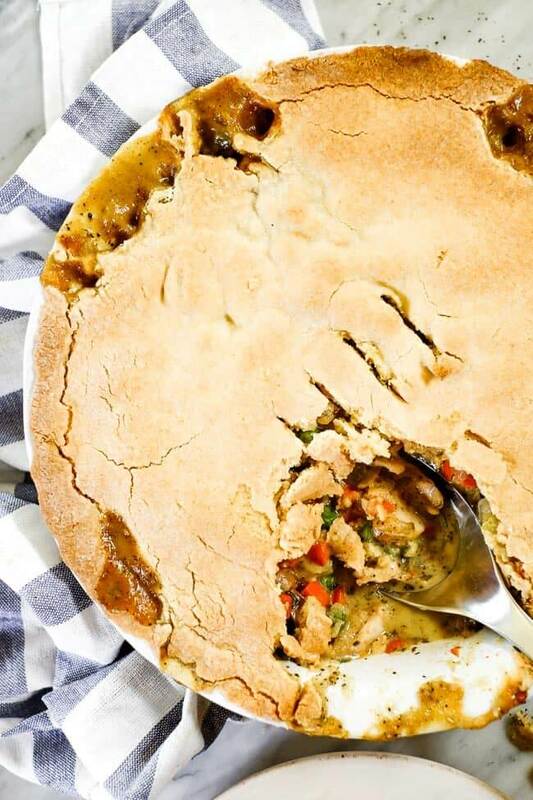 When you think of a chicken pot pie, I bet you get a cozy feeling because of the crust. 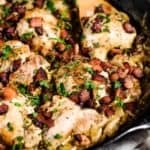 It really makes this dish feel like total comfort food. And making a crust without gluten and dairy can be a little tricky. We’ve found that the combination of Bob’s Red Mill Paleo Baking Flour, their Tapioca Flour and some palm shortening makes for a great crust!! 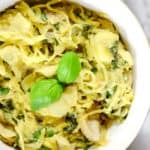 It is definitely a little less flaky than a traditional crust and a little bit more crumbly, but the flavor and how it pairs with the filling is pretty amazing, especially if you’ve been craving comfort foods! Side Note: If you are not a huge fan of palm shortening or can’t find a good, sustainable source but you tolerate dairy, you could try doing a mix of grass-fed butter and coconut oil instead – equal proportions of each. When it comes to quality, gluten-free flours, we love Bob’s Red Mill and have been using their products for years now. This recipe calls for both their Tapioca Flour and the Paleo Baking Flour. These two flours are our go-to’s in the kitchen. The Paleo Baking Flour is a mix of gluten-free flours in the perfect ratios and is great for all your baking needs. 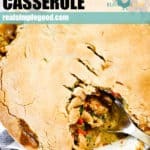 The Tapioca Flour is great for baking and also for thickening up sauces like we do in this chicken pot pie casserole. We love Bob’s Red Mill because of their commitment to high quality and minimally-processed products from the mill to our table. Bob’s Red Mill is employee-owned, and we think it’s pretty cool that even though they’ve grown to be a larger company, they keep their family feel. Plus, they’re a local company headquartered here in Oregon, and we always love partnering with and supporting local companies! 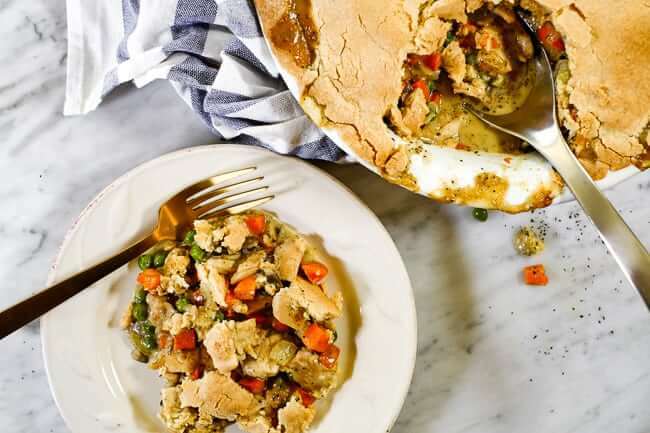 Plan to get real cozy, and make this chicken pot pie casserole! Grab some Bob’s Red Mill Tapioca Flour and their Paleo Baking Flour. You’ll get plenty of use out of it and enjoy all your favorite comfort foods again. Leave a comment below to let us know how it goes. Also, take a picture to share on Instagram. Tag us @realsimplegood, and give us a follow if you don’t already! We’d love to stay connected! 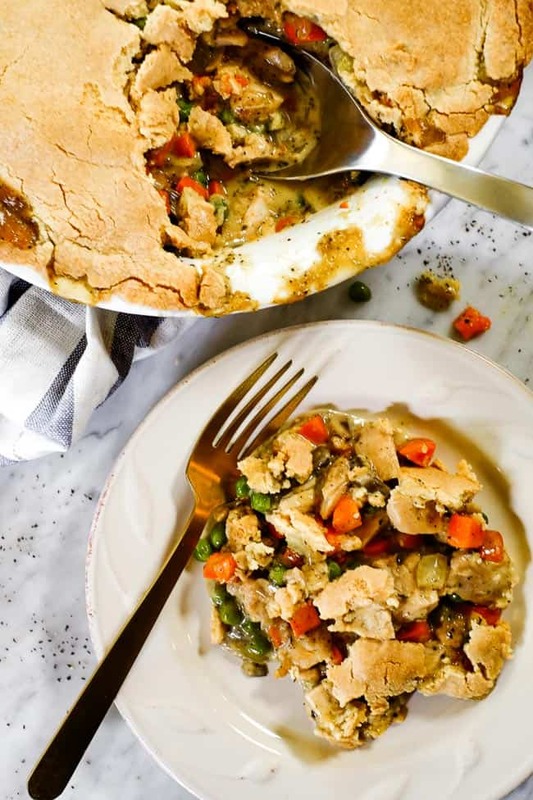 This Paleo chicken pot pie casserole has a creamy, dairy-free filling with all the chicken pot pie goodies, and a crust that will have you swooning! Grease a 9 inch pie dish with ghee, set aside. Prep, carrots, celery, onion, garlic, mushrooms, chicken and peas as noted. Heat a large skillet over medium heat and add in ghee. Once melted, add in carrots, celery and onions and cook for 4-5 minutes, stirring occasionally. Sprinkle vegetables and chicken with the flour and cook for 2-3 more minutes, stirring continuously. Stir in chicken stock and scrape the bottom of the pan to deglaze the pan. Pour in the coconut milk and stir well to mix. Remove from heat and sir in peas. Pour chicken mixture into the prepared casserole dish. Now, preheat oven to 375° F and make the crust. Place all of the crust ingredients in the bowl of your food processor. Pulse the palm shortening into the dry ingredients until dough forms. Take the dough out and form it into a ball. Sprinkle some tapioca flour on a piece of parchment place and place the dough on top. Add more tapioca flour to the ball of dough and top with another piece of parchment paper. Use your hands to press it out into a round crust that will fit over the top of the pie dish. Remove the top piece of parchment and flip the crust and drape it over the chicken mixture. Peel the last piece of parchment off the top and trim or crimp in the sides as needed. Poke a few holes in the top of the crust with a fork or knife to release steam. Place in the oven and bake for about 30 minutes, or until top is golden brown. Allow to cool for a few minutes before serving. Enjoy! 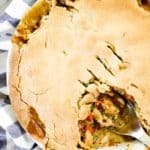 Does this pot pie freeze well? 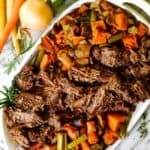 I am having a home birth soon and looking to have some yummy comfort food stocked up in the freezer! Please see the response above :).